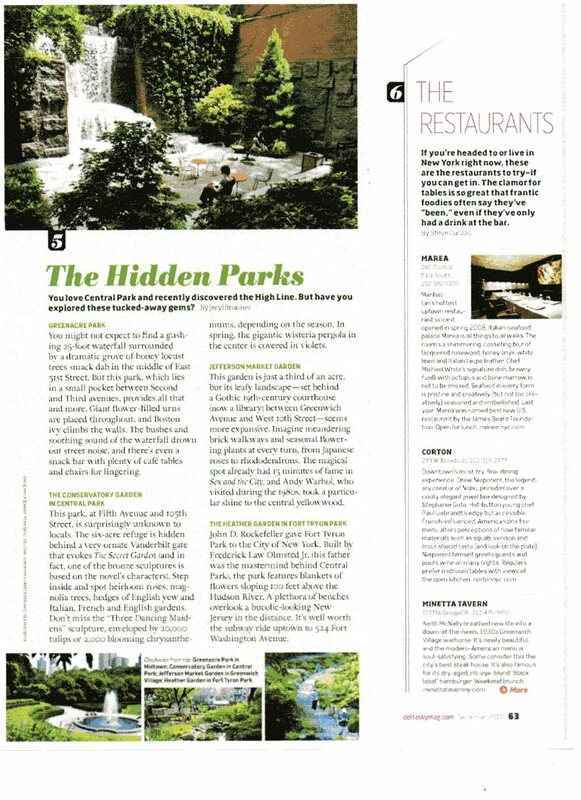 Jefferson Market Garden, Greenacre Park, The Conservatory Garden (Central Park), and The Heather Garden (Fort Tryon Park) are "tucked-away gems," wrote Jeryl Brunner in the September 2010 issue of Delta's Sky magazine. Jefferson Market Garden borders the very busy Sixth Avenue aka Avenue of the Americas, but the garden is easy to overlook for two main reasons. One, the garden does not have an entrance on Sixth Avenue. Its entrance is on Greenwich Street. Two, the garden's Sixth Avenue fence is covered in vines and climbing roses partially obscuring views into the space. Before there was the Jefferson Market Garden there was the Jefferson Country Market founded in 1833, then the Womens House of Detention built in 1927, and finally in 1974, the land was transferred to NYC Parks and has since been stewarded by the Jefferson Market Garden Committee, Inc. (The standing 1877 courthouse is now a public library.) The garden was designed "in the spirit of Frederick Law Olmsted" by landscape designer Pamela Berdan. On a recent visit on a sunny Saturday afternoon, there were many visitors including friends of the volunteers staffing the entrance, strollers, sightseers, loungers, an amorous couple, and a pair of women seeking gardening inspiration. My favorite parts of the garden were the white blooms of oakleaf hydrangeas and mallows, small greenhouse, the babbling fish pond, and two large Kentucky yellowwood (Cladrastis kentukea) trees growing in the central lawn. (The former Latin name was Cladrastis lutea.) The garden's website describes the trees as "rare." The yellowwood's habitat can be found in "relatively small portions of the southeastern United States" and the trees are "scattered and not common throughout [their] range," according to the University of Connecticut's Plants Database. Yellowwood was named for the color of its heartwood - yellow - and was used in the dye industry. I missed the spring bloom of "perfect white and very fragrant" flowers, but will visit the garden again in the fall to see the trees leguminous fruit pods. Yellowwood is in the Fabaceae (Leguminosae) or pea (legume) family.